Crafter's Cupboard: Where did the last week go?! I did get some knitting done this week, but it was minor and really, you don't want another progress picture of the sweater. It's at such an uninteresting stage (middle of back panel) that when I start decreasing for the arms (or whatever) I'll take a pic then. Most of the past week was spent on clean up projects around the house/yard. I'm still trying to de-clutter the house some so it seems like I'm bagging up endless amounts of stuff and getting rid of it. You wouldn't know it to see the place though. lol It's shaping up, although it seems to be taking a long time. 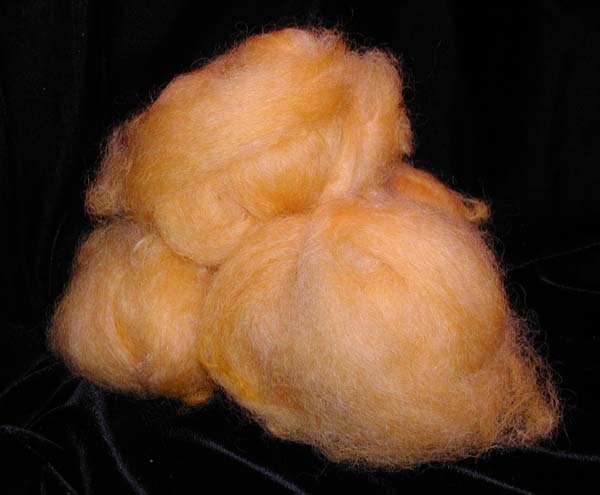 One of the projects on my list is to get all of the dyed fiber that I have hanging around carded up so it can be spun. I've had these all picked and waiting to be carded. Yes, they've been sitting in the basket whimpering, just waiting for a run or two (or three) through the carder. Poor woolies! Well no longer! 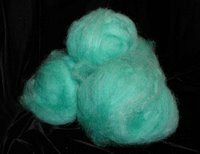 I spent my knitting time on Saturday and Sunday carding fiber and was able to get all the picked fiber done. See below for proof! There are three balls of fluff there to be spun up. I have two sets of this color-one slightly greener- as this was the color left over in the dyepot after some dyeing disaster previously. Somehow I didn't get a pic of it...so you'll just have to believe me! I'm not in love with this color, but I'm sure I'll find something to do with it. This is the Mango Kool-Aid and it's still fairly varigated in roving form. Now...yellow is another "not really my" color but I can't help picking this up and looking at it. I think it's because it's so sunny and warm looking to me. It's asking to be plied with the Moss Green from a few posts ago but I explained that the Moss Green has a crush on some as yet uncarded natural brown fleece. Negotiations will commence next week. (If Moss Greens not careful, Yellow and the "as yet uncarded" Natural Brown may end up running off together. This was the nicest results of the jar dyeing I've done so far. 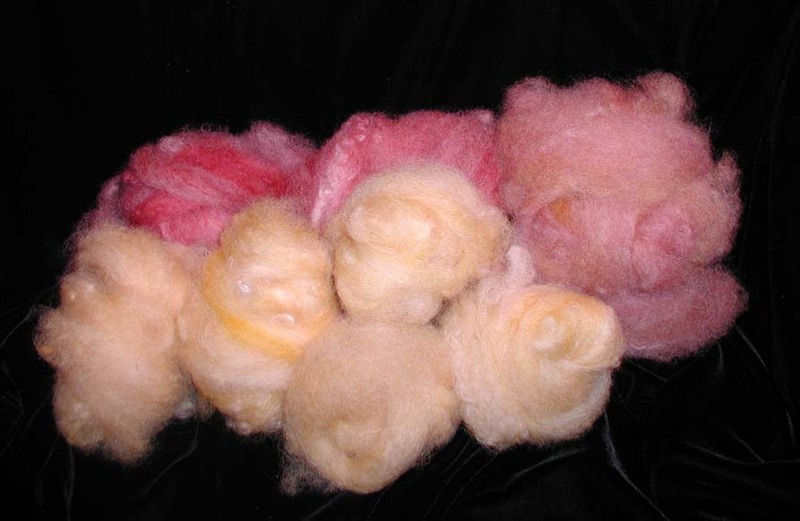 In the front is a buttery yellow and in the back is a purple and rose blend and then there is one ball of a blend of the two for transitioning. Totally unexpected but wonderful all the same. Another totally cool thing happened this weekend. Don spent the better part of his weekend retro-fitting the cupboard over the stove so that a microwave could be installed there. It looks fab, works wonderfully and I'm sooo happy! Oh yeah, and we weighed in after the first week of the new diet......Don lost 7lbs and I lost 8lbs. I'm so excited it's stupid! So onward we continue! 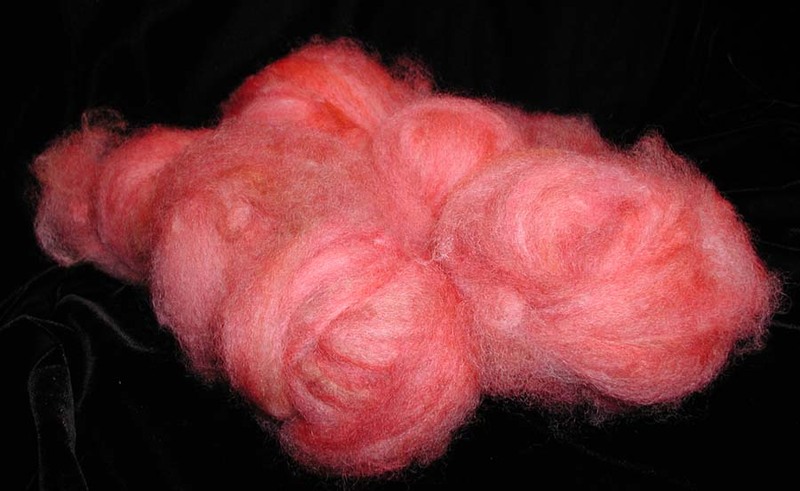 Ok I've got more fiber to pick tonight so I can get it through the carder too. I'm hoping to do some more fiber dying soon as I want to try the microwave method and see how that works for me.